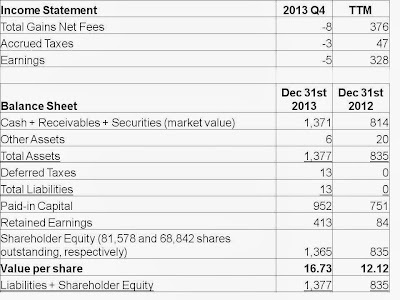 For the fourth quarter ended December 31st, 2013, KVF lost $0.05 per share, reducing the value of each share to $16.73. In each of the four quarters previous to this one, KVF had outperformed both Canadian and US markets; that streak came to a halt this quarter. 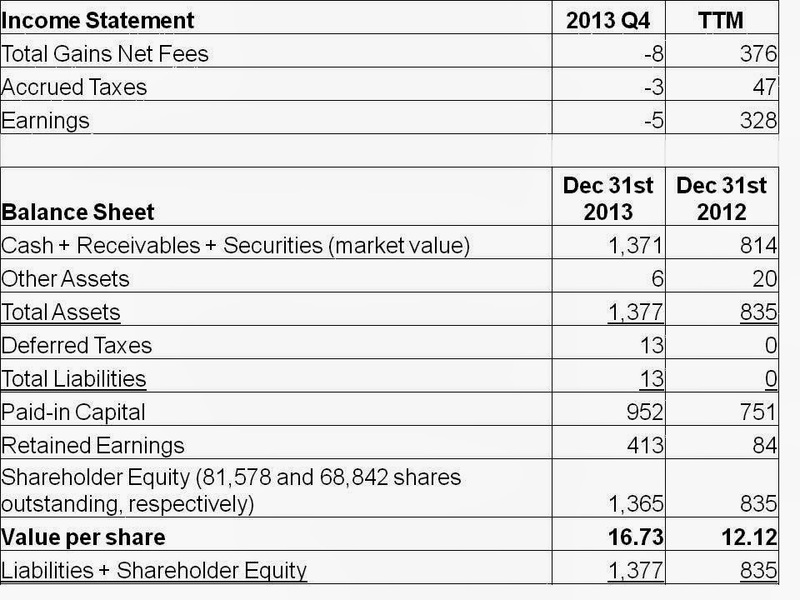 Still, 2013 was a great year for the fund, with KVF having returned 38% after taxes and other costs. This level of return is not likely to persist, as the strong tailwind provided by the broad market (the S&P 500 returned 30% while the TSX gained 10%) is unlikely to repeat. The fund's underperformance this quarter was due to two main factors. First, what I believe was a poor decision on my part to invest in Aeropostale, as further discussed here. Second, a few companies in the portfolio saw their shares fall after issuing their interim reports. In most of these cases, I view the problems faced by these companies as either temporary or unrelated to their intrinsic values. Therefore, in some cases, more shares of these companies were added to KVF's portfolio due to the increased attractiveness of the prices of these issues. Mitigating the underperformance this quarter were price gains in Best Buy, InfoSonics and Nortech (as described here, here and here, respectively), in which KVF no longer owns any shares. Also mitigating the loss this quarter were currency gains; had the CAD/USD exchange rate finished the quarter at the same level at which it started the quarter, earnings per share would have been lower by 35 cents. As the US market has continued its ascent, over time KVF's portfolio has shifted towards non-US (especially Canadian) companies. This is not on purpose or the result of a macro-economic call; it's just easier to find value outside of the US as a result of that country's strong share price gains. This shift will act as a drag on KVF's relative performance (and likely already did, throughout 2013) if the US market continues its outperformance of late. But that's okay; the fund's focus is on capital protection and appreciation over the long-term. Great work. As always, long-time fan. Do you do an actual DCF analysis to arrive at an intrinsic value? Or do you just work with approximations and focus on qualitative merits of a company's competitive position and their ability to sustain previous free cash flow to equity. I see Damodaran doing all this stuff with spreadsheets, etc.,and arriving at precise numbers for intrinsic value (which he often adjusts every quarter). Can you elaborate on how you're arriving at "Shares outstanding" for your fund. I'm not planning on opening a fund or anything in my lifetime, but I am curious on how you're calculating that. If, say, someone invests $10,000 in your fund tomorrow, do the "shares" increase? Have u looked at CLCN? promising business with good free cash flows coming in both from franchise openings plus royalties. Would be one to look for. Thanks, Amit. Yes I do DCF calculations, but without getting too precise. That's correct, shares outstanding increase if/when an investor buys in. Hi Anon, I'm not too into the "promising" companies. A stable, profitable history in the absence of hard assets is usually a must. I know in the past your fund's returns have sometimes suffered and other times benefited from foreign exchange fluctuations, especially the CAD/USD exchange rate. I think you've stated many times, in one way or another, that such fluctations are random and unimportant over the long term so you don't worry about them. But in all seriousness, there is some theoretical justification for hedging at least some of the foreign exchange risk of an equity portfolio. (I think the best paper is a classic from Fisher Black called "Universal Hedging: Optimizing Currency Risk and Reward in International Equity Portfolios".) It basically boils down to this: foreign exchange can be thought of as a return-free risk; i.e., unless you have a strong view that the foreign currencies will appreciate compared to your home currency, one might say you're taking risk without getting any expected return when you decide not to hedge against foreign exchange fluctuations. To me, volatility is not risk. As such, I'm perfectly happy to accept the bouncing as opposed to paying real money to flatten the bouncing, which because of fees would only hurt returns over the long run. I'd like to offer you some food for thought, because I've come to realize that most value investors misunderstand Modern Portfolio Theory, and I think it's related to your reply to my foreign exchange hedging question. Let's say someone offers you the choice between two investments, A and B. You expect that, averaged over the next 10 years, A will return 7.5%/yr but there's uncertainty in that expectation. To model this uncertainty, you estimate the standard deviation around your 7.5%/yr expectation to be +/- 5%/yr. For investment B, your 10 year return expectation is the same 7.5%/yr, but there's more uncertainty this time (perhaps due to a greater financial or operational leverage), so now you estimate the standard deviation around your 7.5%/yr expectation to be +/- 10%/yr. Question: which investment is superior, A or B? Notice that I've framed the problem in terms of long-term return expectations and level of uncertainty around those expectations, not in terms of short-term fluctuations or "volatility". As Saj pointed out, hedging costs money. So, if your question was meant to have Saj choose between the expected return of a hedged portfolio and that of an unhedged portfolio (and I'm not sure that was your aim), it would better reflect reality if the numbers were changed to an expected 7.5% +/- 5%/yr for A, and 6.5% +/- 10%/yr for B. Actually hedging can be done at minimum cost using futures contracts. If we assume for simplicity that interest rates are the same in the local and foreign currency, then theoretically it's possible to eliminate the risk of foreign currency depreciation at almost no cost. It's not literally zero cost, since you may have to pay something like $5 of brokerage fees / trading commission for every $100K of foreign currency you're hedging, but the cost can be made extremely low. So in order to understand this issue at a conceptual level, I think it's best not to get distracted by issues like trading commissions and brokerage fees; the real issues are more fundamental than that. I'm indifferent to those two options. That said, I did not know one could get $100K of currency hedged for a $5 brokerage fee. What is this product?? You'd need to have access to futures contracts. One futures contract for "CAD" (CME globex exchange) corresponds to $100K Canadian Dollars priced in US dollars. So if you buy one futures contract, you're effectively long $100K CAD and short the equivalent amount in USD (which is the exposure you'd want if you live in Canada but own US-denominated assets and want to hedge the risk of USD depreciation). The trading commission to buy one futures contract is very low at Interactive Brokers - don't know the exact number, but it's probably less than $5. You do need to keep in mind interest rate differentials, however, and the whole thing is more complicated than I've made it sound here, but that's the basic concept. By the way, I see you say you're indifferent to the A/B options I presented as a thought experiment. If we remove currency hedging from the discussion, since it's admittedly complex, I think you'd find that very few knowledgeable value investors would agree with your statement, including Warren Buffett. You're basically claiming that one should invest based on maximizing expected return and not worry about uncertainty in one's estimate of future return. I could give a large set of examples that would prove that theory wrong, and I can assure you that Buffett (and probably most other value investors you respect) would agree that uncertainty in future return (also known as risk) is a key thing to consider. If hedging is as cheap as that, you are right and I am wrong, and your question was a good one as phrased. I think the answer to it depends on the number of bets you place: if your portfolio is highly diversified, it would produce something very close to expected return either way. But if, like Warren Buffett, you like a concentrated portfolio, the uncertainty associated with a particular bet's expected return could have a big effect on your portfolio's return, and that's probably why he doesn't like it. A totally unrelated comment: I've been reading this and other blogs for many years, during which I've read quite a few incisive comments/questions by you. Saj's lucky to have you as a reader. Besides the cost of commission, there is a carry cost for the futures. I am sure aagold is aware of this, but perhaps not everyone else who follows the blog. The carry cost is the differential for interest rates between the US and Canada. I don't consider your example to apply to CAD/USD. IMO, those currencies are correlated, and so over a long period of time (which is appropriate for me, as I plan to be invested in the US my entire life), the difference between them will be tiny on an annualized basis. Of course, in any one year, the difference can be dramatic, but I'm willing to accept that. That's what I see as volatility rather than risk. Your circumstances may be different. When you sell a Canadian investment, you may wish to repatriate your funds or invest in another country. For you, those large annual swings could be something you should be hedging. In addition to the interest rate issue and the brokerage commission, there is of course also a bid-ask spread, which should be included as part of the transaction costs. That's an interesting perspective on the topic. To be honest I haven't given this forex issue a great deal of thought yet, but at some point I will. Up to now I haven't hedged and I actually liked owning assets denominated in diverse currencies other than USD. But as my question to you indicated, I've been thinking about it some more lately. One important thing to keep in mind is that forex risk for equities is quite a bit different than forex risk for fixed income, at least for non-financial companies. That's because equity ownership is equivalent to *real asset* ownership. So if the foreign currency depreciates because of inflation, for example, in theory that company's revenue and earnings should grow with inflation thus preserving the equity's value. So I do think it's clear that hedging forex risk for equities is less important than it is for fixed income. The situation with USD/CAD is unique since the trade linkages are huge. But I will say that when I was a kid (and I'm now 45, just for reference), 1 CAD was worth somewhere around $0.50 USD. So at least over the course of my lifetime the exchange rate has changed quite a bit. But if we annualize over 35 years that's still only about 1.8% per year.